Owners of Blu-ray DVD players may find themselves frozen out of future developments in the technology because their machines are not upgradeable. The Blu-ray camp has recently rolled out new features for players, which include picture in picture options. But the majority of Blu-ray players sold to date do not have the necessary hardware to offer the features. Some discs already come with a note telling users that they may need to upgrade software in their machine. In some discs, the note reads: "To ensure the best possible viewing experience, your Blu-ray disc player may need a firmware or software update." But these updates relate to improvements in playback and do not offer a pathway to the new features. The issue has arisen as Blu-ray attempts to offer new features to compete with rival standard HD-DVD. When the first Blu-ray machines were launched the hardware requirements for manufacturers did not include provision for planned developments. 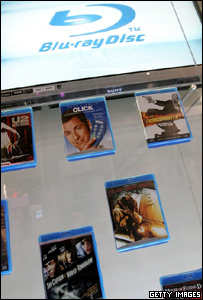 Instead Blu-ray players were divided into so-called "profiles", with all machines released before November 2007 designated as profile 1.0. Machines released onto the market since November are called profile 1.1, but none of the standalone Blu-ray players can be upgraded to accommodate this profile. Films will still play on the machines, but access to extra features is limited. Later this year the Blu-ray camp will offer profile 2.0, called BD Live, which will allow the players which support the feature to connect to the internet to download related content, such as ringtones, trailers and photos. But because internet functionality is not a mandatory requirement in current players, none on the market today will be able to access the feature. The only Blu-ray player which can upgraded to use all the features is Sony's PlayStation 3, because it comes with the right hardware built-in and online access. Frank Simonis, of Philips and the European chairman of the Blu-ray Disc Association, said the division of Blu-ray players into potentially three camps was "not an ideal situation". But he denied that consumers would be confused. "Whether you have a profile 1.0, or profile 1.1 machine, the playback is not disturbed. It's the high definition playback that consumers are seeking." Philips has just released its first player which supports profile 1.1 and Mr Simonis confirmed that older players could not be upgraded. Mr Simonis said the reason Blu-ray backers had launched players which could not be upgraded was one of timing. He said: "The discussions relating to features took place at a point in time when every hardware company had frozen the architecture for their first generation of players. "We needed to create momentum and get the players on the market. If we had postponed launch to add in the hardware for the latest features, we would not be in the situation we have today." The release of players which cannot be upgraded was unlikely to ease consumer confusion around high definition DVD players, said Alastair Upham, editor of DVD Review magazine. "One of the big problems with the Blu-ray format when launched, and something which gave the HD-DVD camp ammunition, was that Blu-ray wasn't finished - they hadn't agreed on a standard. "And that problem means that an early adopter of Blu-ray could have spent £1,000 on a player only to find he potentially can't play newer releases. "So while there are discs out there with better features, if you have an earlier player you can't take advantage of this." The Blu-ray camp received a boost at the Consumer Electronics Show in Las Vegas last week when film studio Warner dropped support for HD-DVD in favour of its rival. But Mr Upham said the format had a lot of work yet to do to reassure consumers they are safe to upgrade from DVD. He added: "If Blu-ray wants to reach a wider audience, it needs to have more clarity." But he said the likely victims of the Blu-ray profiles issue was almost certainly a limited audience. "The guys that bought the first Blu-ray players are the guys who bought the first laser discs. They know the risks."